As with all its surfaces, Vetrazzo has made “going green” beautiful and functional by using up to 85% recycled glass content in its products all at once conforming to strict green building and environmental standards in the production and distribution of high-quality products. And it looks like we are in good company. Many top brands are shifting their focus helping consumers design and build kitchens with our environment in mind. From energy efficient appliances to LED lighting, trends in kitchen design are leaning towards energy saving, smart technology that blend functionality, aesthetics and an increasing awareness for our planet. Brands from LG to Electrolux to Kichler are helping pave the way for sustainable products and we applaud our friends at KB+B for recognizing these advances. Our Vetrazzo Amethystos glass surface features purple-hued cranberry glass combined creamy-pearlescent oyster shells that come directly from the South Carolina Coast. Subtle hints of violet, warm cream and gray allow the surface to be paired with bright bolds or classic neutrals, bringing a piece of the ocean into any home, in any season. 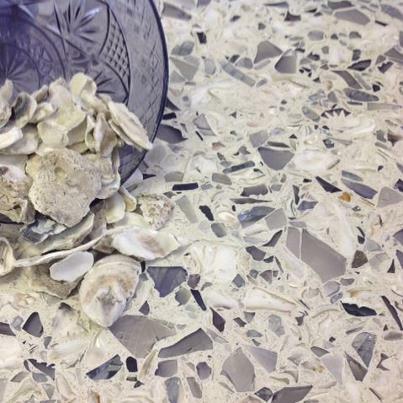 Vetrazzo’s Coastal Collection features other unique elements—the float glass stems are post-commercial and the bits of marble come from the historic Georgia Marble Quarry. Every surface is covered and polished with a smooth, glossy finish that makes the countertop even more reminiscent of the ocean. As always, all the materials used in our countertops are made in the USA. While “being green” is first and foremost in the decision making process for some consumers, for others it’s just one piece of a larger picture. While not always the driving factor, having elements of nature and sustainable practices incorporated directly into products does provides many consumers with a piece of mind and an extra “feel-good” touch when it comes purchasing decisions. 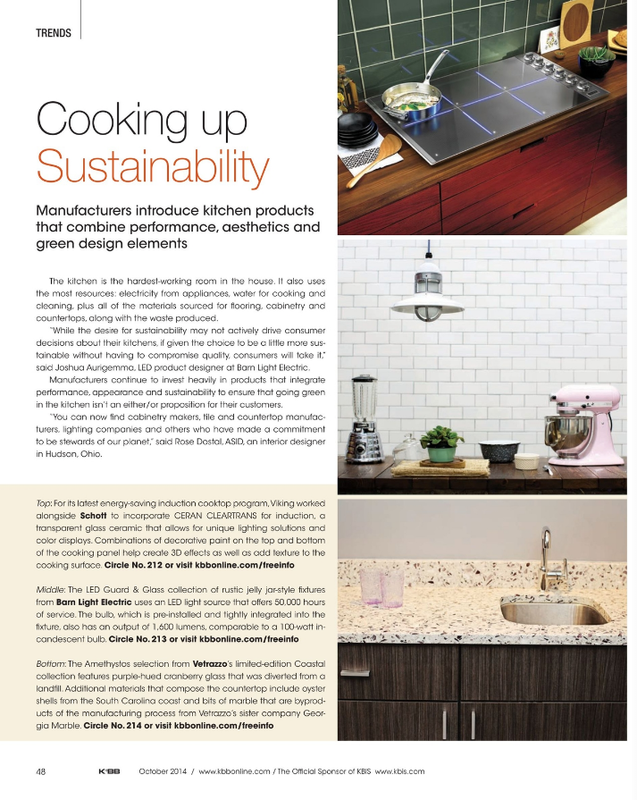 Whether your primary objective in designing your own kitchen is sustainability, pure aesthetics or American-made products, we support consumers exploring new options and choices as the market from green residential design products continues to evolve. Vetrazzo – Green. American. Sustainable. Beautiful.